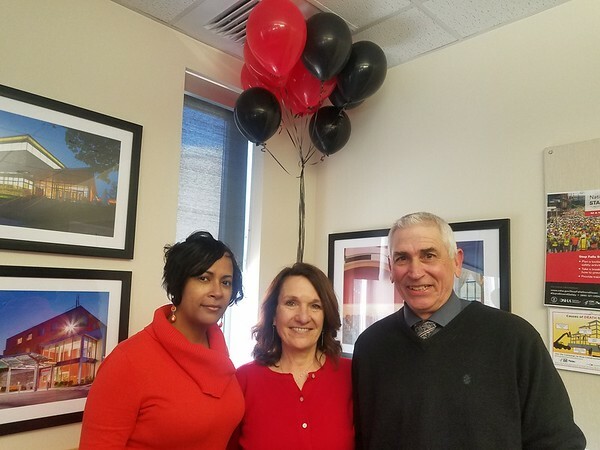 NEW BRITAIN – Downes Construction Company, LLC unveiled a community giving program as part of their 85 years in business celebrations on Tuesday; they announced the recipients of the donations are unsung hero teachers of the city, the Boys & Girls Clubs of Hartford and the The WorkPlace in Bridgeport. Joseph Desautel, Jr., chief executive officer of Downes Construction Company among other company employees, state Sen. Gennaro Bizzarro, Nancy Sarra, Superintendent of the Consolidated School District of New Britain, Nelba Márquez-Greene and other community members took part in the event. Downes’ 85th anniversary giving program is modeled after the Ana Grace Project. Downes’ give back campaign will give a $1,000 check to each of the 12 unsung hero teachers in each of the 12 elementary schools of the Consolidated School District of New Britain. The money is for the teachers to spend in their classroom. The first three teachers receiving the funds were announced at Tuesday’s event: Cathy Scanlon, of Gaffney Magnet Elementary School, Tamika Anderson, of New Britain Transitional Center and Butch Malinowski, of Chamberlain Elementary School. The rest of the teachers will be announced on surprise occasions. The Boys & Girls Club of Hartford are also going to be helped through Downes’ give back campaign. The construction company is also partnering with The WorkPlace to get Bridgeport residents trained into construction careers. Bizzarro, who was one of the speakers at the event, said that the company has played an important role in the city throughout its 85 years, not only because of their business success, but also because of their community service. To learn more about Downes Construction Company, call 860-229-3755 or visit www.downesco.com . Posted in New Britain Herald, Business, General News, New Britain on Tuesday, 26 March 2019 20:12. Updated: Tuesday, 26 March 2019 20:14.